As the numbers extend higher, the pickings continue to thin. Fewer and fewer players have worn the numbers as they climb into the sixties and beyond. The numbers have also generally been worn for shorter amounts of time, assigned to rookies just making the Majors. If the rookie succeeds, they usually change their number the following season. If they don’t make it, well, they aren’t wearing the number long. Therefore, I am going to do more than just five players at a time and close out this series of articles with just two more articles. 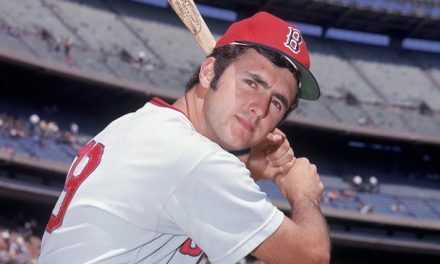 Unfortunately, no Red Sox player has ever worn the number 69, so here are the greatest to wear the numbers 61-68. Bronson Arroyo is one of the few players who stuck with his high number, wearing 61 for his entire career. 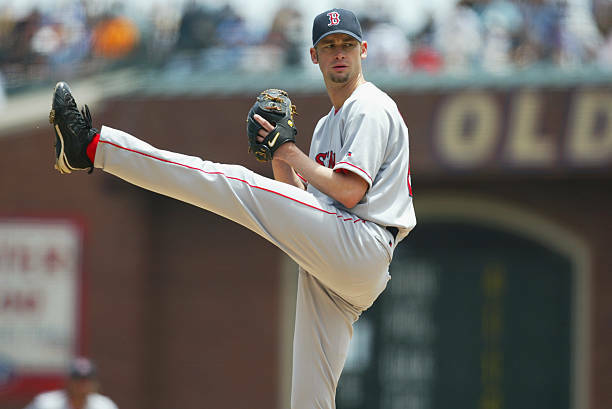 The Red Sox grabbed Arroyo off waivers before the 2003 season, and what a find it was. Arroyo pitched in Pawtucket for almost the entire first season and threw a perfect game down there, just the fourth in International League history. 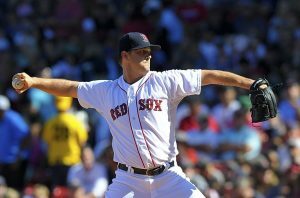 He pitched 17.1 innings for the Red Sox out of the bullpen, allowing just four earned runs. This earned him a spot on the postseason roster, where he performed well. Arroyo earned himself a rotation spot in 2004, making 29 starts. He finished the year 10-9 with a solid 4.03 ERA and 1.22 WHIP. He made a good start in the ALDS, allowing two runs on three hits over six innings. In the ALCS, he was involved in the famous Alex Rodriguez “slap” play at first base. In 2005, Arroyo made 32 starts and pitched over 200 innings, starting a streak of nine straight seasons with 199 innings or more thrown. He went 14-10 with a 4.51 ERA in the regular season. 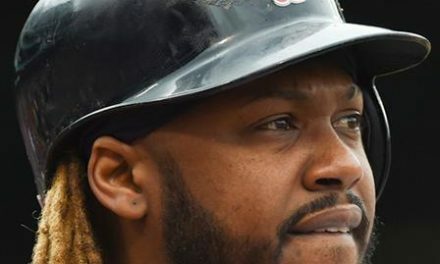 The Red Sox mistakenly traded Arroyo in the offseason for Wily Mo Pena, but he left his mark on Boston. Alex Rodriguez illegally slaps the ball out of Bronson Arroyo’s glove as he went to tag him out running to first base in game 6 of the ALCS. This is the second number Lester has been chosen for, as he was the winner for his typical number 31. 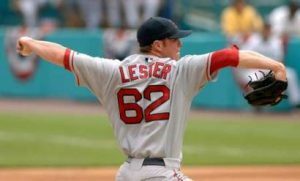 Jon Lester wore the number 62 during his rookie season of 2006. Once he was an established Major Leaguer following the season, he changed to the lower number. A highly touted prospect, Lester was rated as the 22nd best prospect in all of baseball entering 2006. The former second round pick was coming off an excellent season in AA Portland. 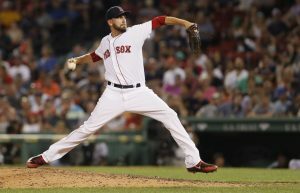 He began the year in Pawtucket and posted a 2.70 ERA over 11 starts before being called up to Boston. Lester would go 7-2 for the big club that season, although with a mediocre ERA. However, he pitched very well for the first half of his time with the Red Sox before possibly hitting a wall. Young pitchers don’t generally throw many innings, so the amount of innings and the impact of the innings being pitched may have caught up to him. Through his first eight starts he was 6-2 with a 2.38 ERA. In that eighth start he allowed just one hit over eight shutout innings against the Kansas City Royals. Although he faded later in the year, Lester was still 7-2 and helped add another reliable starter for over a month. 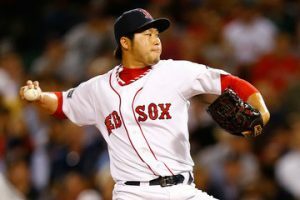 Tazawa was given an honorable mention at the number 36 for his work from 2013-2016. However, before that he was wearing the number 63 from 2009-2012. He is here for his work in 2012 alone. Junichi Tazawa at one time was a pretty decent prospect for the Red Sox as a starting pitcher. He made his debut in 2009 and got the loss against the Yankees in his first game. He did not fare much better after that either, making four starts and two relief appearances total. In 2010, he blew out his arm in April and missed the whole season. When he came back in 2011 it was as a reliever. He only made three appearances for the Red Sox that season. With the slim pickings at the number, Tazawa earns the top spot on the strength of 2012 alone. Tazawa pitched 37 games in 2012, allowing just seven runs over 44 innings. He struck out 45 batters while posting a 1.43 ERA and 0.95 WHIP. He was arguably the best reliever on that mess of a team. Will Middlebrooks arrived in 2012 as the Red Sox best hitting prospect. He was ranked number 51 by Baseball America at the start of the year and only improved his standing as the year wore on. After raking at Pawtucket for a month, Middlebrooks was called up and made his Major League debut on May 2nd. Middlebrooks hit all season for the Red Sox, bashing 15 home runs over 267 at-bats. He batted .288 and posted a slugging percentage of .509 at the big league level that rookie season. This would be the only season he wore the number 64, and it was easily the best season of his career. 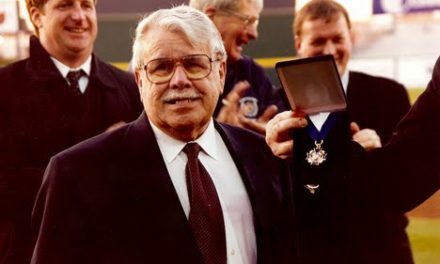 However, he did win a World Series ring with the club the following season. Wright might be the unlikeliest winner of two different numbers, having gotten the nod at number 35. There was little competition at that number, and there is zero competition at this one. The only other player I noticed who contributed anything pitched 3.1 shutout innings in 1998. Steven Wright wore the number 65 for the 2014 season. That year he threw 21 innings, mostly in relief, and had his first Major League success. Even with the knuckleball, Wright struck out 22 batters against just four walks. He posted a 2.57 ERA and 1.19 WHIP that season for the Red Sox. He has worn the number 35 ever since. As you can see, there isn’t a lot to choose from at some of these numbers. 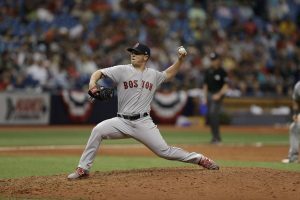 Not to take away from Poyner, he did a good job for the Red Sox this past season, but he has only thrown 22.1 innings. Only five players have ever donned the uniform 66 for the Red Sox. A left-handed reliever, Poyner had a fantastic spring and surprisingly pitched his way onto the ballclub. He pitched effectively over 20 appearances, going 1-0 with a 3.22 ERA. His WHIP was an excellent 1.12 and he struck out 24 batters against only three walks. The low walks are an excellent total for a lefty reliever, as they generally walk a fair amount of guys. Workman is one of four Red Sox to ever wear the number, and the only one to play in more than 11 games. He has had his positives for the club though, this past postseason aside. Workman first appeared with the big club in 2013. He struck out 47 batters over 41.2 innings that season, making three starts and 17 relief appearances. He had a 6-3 record despite a 4.97 ERA. Workman did make three straight good starts to close out July. A few rough outings skewed his overall solid body of work. Workman then pitched 8.2 innings without an earned run over seven postseason appearances. 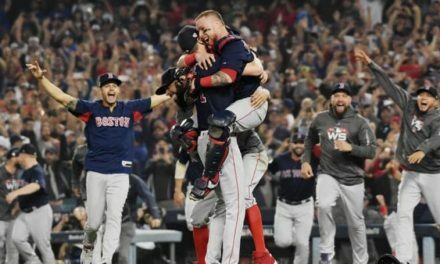 His work out of the bullpen certainly helped the Red Sox as they won their third World Series in nine years. The next season, Workman had a 3.27 ERA at the end of June before the wheels came off. He finished 1-10 with a 5.17 ERA. Workman wound up hurting his arm and it was a long road back to the Majors. He found his way back in 2017 and had a 3.18 ERA over 33 relief appearances. This past season he wore the number 67 for a bit and the number 44, going 6-1 with a 3.27 ERA in the regular season. This gives him a 3.22 ERA over 81 innings since making it back to the big leagues. Barnes wore the number 68 for his first four seasons before switching numbers for the 2018 season. Of course, 2018 is his best season to date, but he did enough prior to this season. He is the only player worth mentioning at the number. Barnes debuted late in 2014, then struggled as a rookie in 2015. He had an up and down 2016, but showed some promise as he struck out over a batter per inning. He finished 4-3 with a 4.05 ERA. In 2017 he took another step forward, leading into this past season. Barnes was 7-3 with a 3.88 ERA in 2017, posting a career best 1.22 WHIP. He struck out 10.7 batters per nine innings, surpassed only by this past seasons 14 strike outs per nine. PreviousPats Silence the Critics and Ready to Invade Arrowhead!